There is some good news and some bad news. Good news, no new injuries and the Caps safely sail into the post season relatively safe. Bad news, it was a frustrating game for an offensive power house struggling to find itself. The Capitals fall in game 82 as the Florida Panthers score late in the third period to ice the last game with a 1-0 win. At times Bruce Boudreau pushed on 5 forwards in the final minutes to muster up some scoring to tie the game. 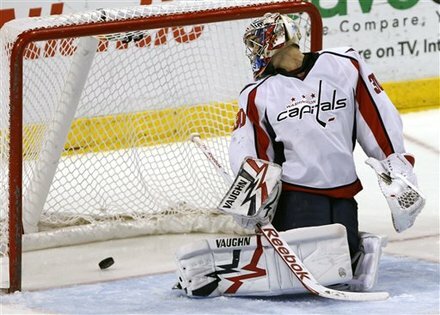 But the Caps failed to make any significant dent in the Panthers' goaltender Tomas Vokoun's shut-out attempt from giving the faithful at Sunrise a reason to cheer. The Panthers scored with 6:05 left in the third when Bill Thomas knocked the puck out of the air, catching Michal Neuvirth off guard and slipping past the Caps' goaltender. It was sort of a flukey goal off the face off. The Capitals special teams played well considering penalties were low on both teams. Just one minor for the Panthers, and a pair of penalties called against the Caps. No fights, no emotion in this one. It was almost like the Caps were just content to get into the post season as the number one seed in the east and get things rolling with their new defensive style. It will be a rematch of two post seasons ago as the Capitals will take on the Rangers in the first round of the playoffs. The Caps were pushed to 7 games with the Broadway Blues before Sergei Fedorov scored the series winning goal in game seven for the Caps' first series win since the lockout of '05. The Capitals finish the season 48-23-11 and with 107 points. Alex Ovechkin lead the team in points (85), goals (32), assists (53), hits (238), game winning goals (11), shots on goal (361). and +/- (+24). Ovi shares the power play goal lead with Mike Knuble, both have 7 goals with a man advantage. Nick Backstrom led the team in power play assists with 18. Neuvirth led the team between the pipes with 27 wins, but it's Braden Holtby with the hot save percentage at 1.79. Matt Hendricks had the most penalty minutes with a modest 108 minutes. As a team, the Capitals finish second in the league in points and games won behind the Vancouver Canucks. They were a modest 19th in the league in goals per game (2.67), but fourth in goals allowed per game (2.33). The power play struggled this season only at 17.5% effectiveness, good for 16th league wide. Their penalty kill has been exceptional finishing fourth in the league at 85.6%.